The third movie from the Kelvin Universe was certainly one of recent Star Trek's highlights and it also saw a revamped rebooted USS Enterprise too. 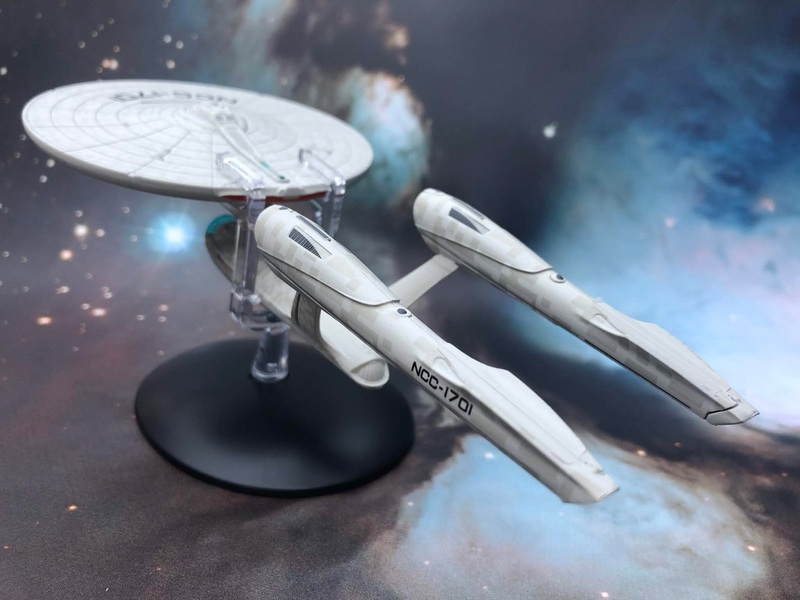 My gripes with the design aside, this is about accuracy and how Eaglemoss translate the onscreen information into the scale model so let’s take it away and get right into the nitty gritty of this item. 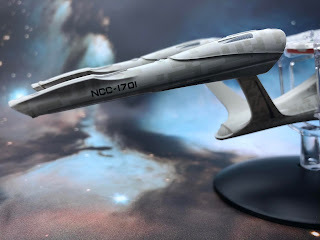 The finish is, to be fair, as basic as it was on the second special, the original Kelvin Universe USS Enterprise which avoided a lot of the minutiae on the surface. As before, the saucer top is metal while the insert is in plastic. The saucer detail could have been so much more screen accurate but instead we have just the slight aztecing of the final coats and some very minimal edging around the bridge module. Dont get me wrong, the aztecing is a wonderful touch here but the lack of colour on the three phaser banks, the running lights and also the RCS thrusters is dreadful. To then only mark up the bridge module with two sets of black strips and leave the rest of it in the base colour is verging on a travesty. Did I mention three phaser banks there? Yes I did - because if you actually look at the refit of this ship there should be at least another four. There ain't. The panel lines across the hull surface plus the actual structure of the central bridge unit are very well produced but the singular lack of colour takes any sense of ‘realism’ if you will, out of the product. Adding insult to injury, there are two T shaped protrusions from the hull to the rear of the saucer which do get colour - if only a darker grey - but are much less significant features on the ship. The plastic insert underneath fairs no better. It continues the aztec pattern but the lack of colour on major features is again glaringly obvious. The central sensor platform is blobbed with a few specks of grey and the dome isn't even fully painted up. It's a grave disappointment and again the phasers and thrusters are left in the hull base coat. Makes you kinda want to scream for mercy. At the rear the wide impulse engine is haphazardly painted in with frayed paint edges and barely fills out the allotted space. Once more any real detail is lost leaving us with the basic shape of the exhaust. Moving down to the neck of the Enterprise it's a pleasant surprise to find that the aztecing continues down what is usually a forgotten area especially on the regular-sized starships. 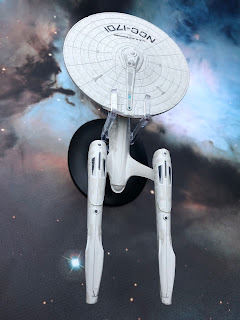 This connecting section is incredibly thin but on the model it does feel sturdy even though there's a hunk of metal saucer perched on the top. A couple of spots of darker grey highlight the forward torpedo launcher and a ribbed section of the neck although the windows are not painted in and remain only as slight recesses on the surface. I can imagine dotting those up would have been a nightmare. The aztec painting flows down into the slimmed down Engineering hull but only on the sides and then only as far as the front of the warp engine pylons. Everything to the rear of that and the back of the neck section is in the single grey/white base coat with no form of texturing on the top of the hull or the inside edges of the warp pylons. The outsides and both warp engines continue the two-tone effect but for some inexplicable reason it just stops dead in a very obvious manner. The lack of panelling detail - any detail - at this point doesn't help, leaving a total blank space that you can't avoid. 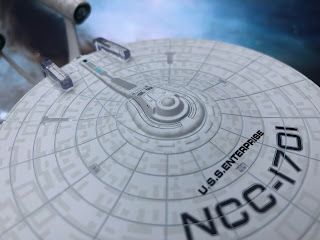 The front end is much more interesting to look at though with the bright blue deflector dish lighting the way and a ship registry and double Starfleet pennants adorning the hull. It's as though someone got bored with this one the further back they got... Anyhows, at least at the back Eaglemoss managed to slap a tiny ship registry underneath the shuttle bay doors but that's all you're getting so no texture, depth or further detail here. Move along. Nothing to see. The annoyingly spindly warp pylons on the outside do have the aztec paint plus some more infamous dark grey paint details but that's all you can really say as it continues to be a bit dull. On the engines themselves the translucent bussard collectors are finished with a web effect which is an unusually fine detail to have included on the ship when compared to what has been left off. The aztec pattern coats them 360 degrees plus that dark grey paint has been out again to pick out the vents and panel changes to add essential depth to what could be too very "flat" tubes. As for build quality here, the pieces do fit together well. There's a slight gap around the underside of the saucer but the remainder of the craft is a good quality construction. It's the paint job that lets this one down on every level and having that huge aztec gap at the back really grates. 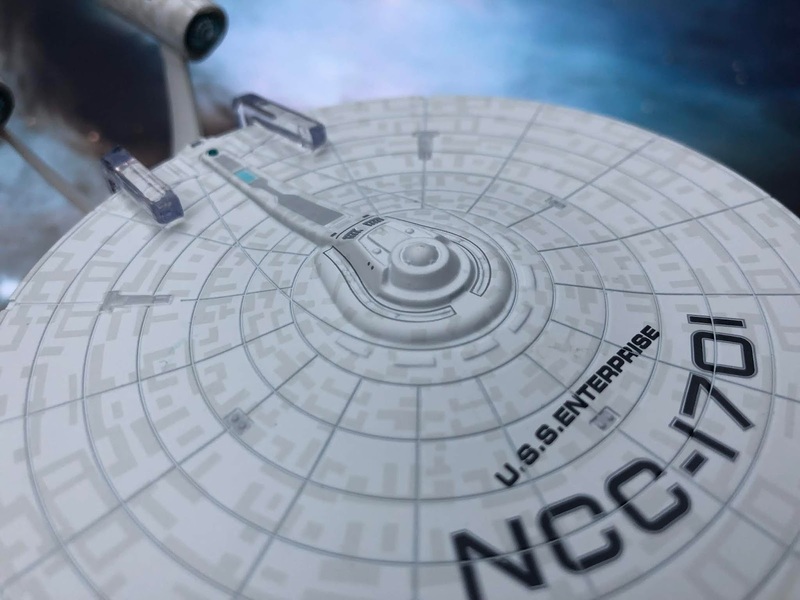 The special edition magazine skates over the rather extensive changes in a fleeting second noting what has taken place between Into Darkness and Beyond before launching into a section dedicated to the design of the flagship craft and also the pimped up "A" that's seen at the very end of the movie. This section encompasses some fantastic pieces of artwork from the development of the third Kelvin Timeline movie as well as the lengths the production team went to when it came to having the ship cut to ribbons by an alien attack. Whether you approved of the abrupt end to the ship or not, the sequence was fantastic and to see the plans here as well as what would happen to the crashed saucer are a real treat for any fan. This is a worthwhile read and something that needed to be documented. All I can say is that it's a shame they had to redesign the ship to make it so flimsy! 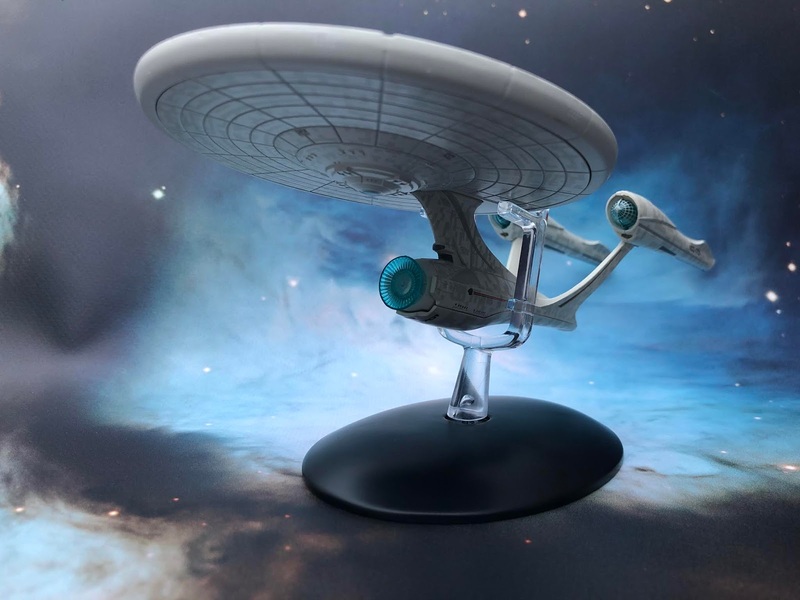 The Star Trek Beyond USS Enterprise Special Edition is a real heart-string puller. 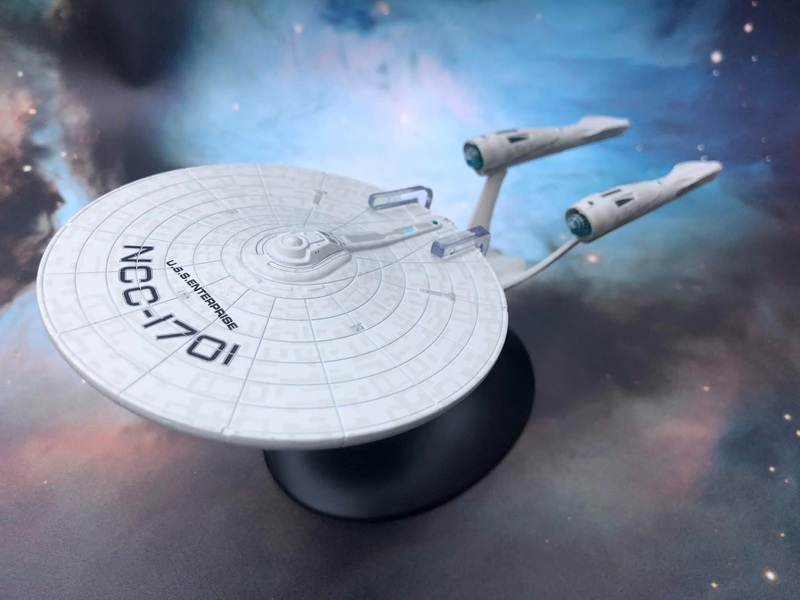 With the news that Star Trek 4 is shelved for the time being, the "A" featured here in the magazine could well be the last cinematic Enterprise for some time and we do need to see it in model form as part of the collection. This model isn’t quite what I hoped for and makes just as inadequate a job of reproducing the Enterprise as happened with the first version of this ship some time ago. Could have made a few more upgrades on the detail to get it properly in line and that’s just on the paint job. 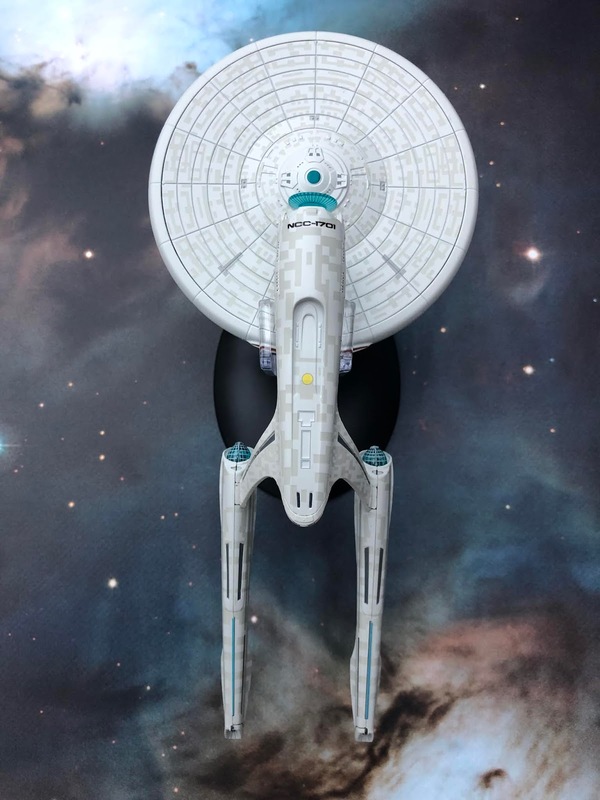 What’s your verdict on the Beyond USS Enterprise?